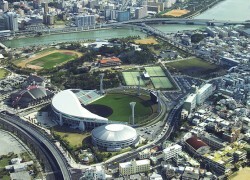 The Onoyama General Athletic Park was the first athletic park built in Okinawa, in 1959. The extent of available facilities and the ideal setting of the park with its spacious lawns make it a prime choice for recreational sports. You can have access to the budokan (indoor arena), gymnasiums for personal training sessions and multiple sports, a swimming pool, athletic fields and tennis courts for a modest fee.